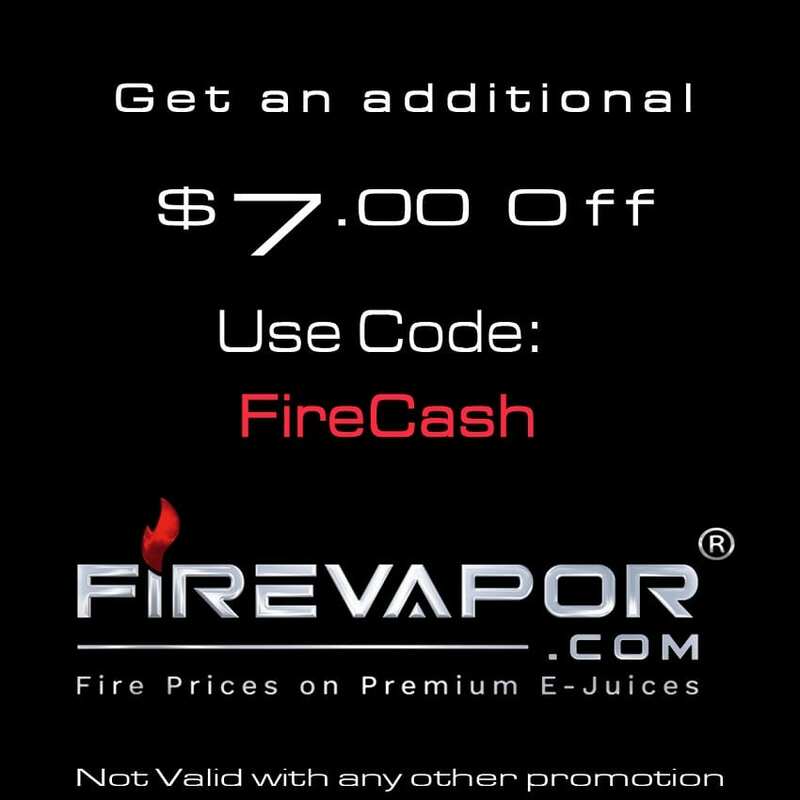 VapeWild is known for offering some of the most affordable e-juice on the market today. 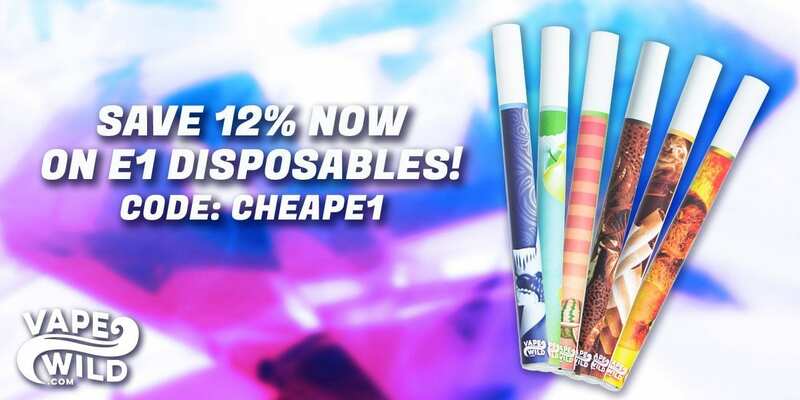 Now, VapeWild has stepped outside of this boundary and is now offering their own disposable electronic cigarette which is the E1! The E1 stands for Everything-In-One, and is designed similarly to what you were used to, analogs. The VapeWild E1 is available in 6 different flavors, and all of these flavors are crafted by VapeWild. Before getting any further, I would like to thank VapeWild for sending this product my way for the purposes of this review. I will give you my first impressions, experiences using this device, performance, pros and cons, and conclude with whether or not I recommend it! Also, I do want to mention that VapeWild is offering a 12% discount for those who are interested in giving this product a try! All you have to do us use coupon code “CHEAPE1” to receive your 12% discount! Click Here to Check Out the VapeWild E1! Use Coupon Code CHEAPE1 for 12% off! Upon first receiving the VapeWild E1, I immediately noticed its attractive packaging. Each flavor (6 in total) features a different design on the packaging, which is definitely a nice touch and adds to the overall experienced of purchasing one of these devices. The packaging itself does say the name of the flavor alongside some information such as the ingredients and warnings. At the top of the packaging, where you would open it, it does mention the milligram, which in this case is 18mg. Once you open the packaging, you are greeted with the VapeWild E1. It is sealed in plastic, which is pro in my book. In addition, it does have a mouthpiece which you can easily slide off. The mouthpiece is great to have, especially when you are taking the E1 out, and want to protect the side which you vape from. These are small things to look at, but it shows the attention to detail for this product. As mentioned previously, the VapeWild E1 is designed similarly to an analog, which some vapers may not like. However, I do think new vapers just switching from smoking will find this attractive and comfortable to use before transitioning into something else such as a box mod and rebuildable atomizers or sub ohm tanks. 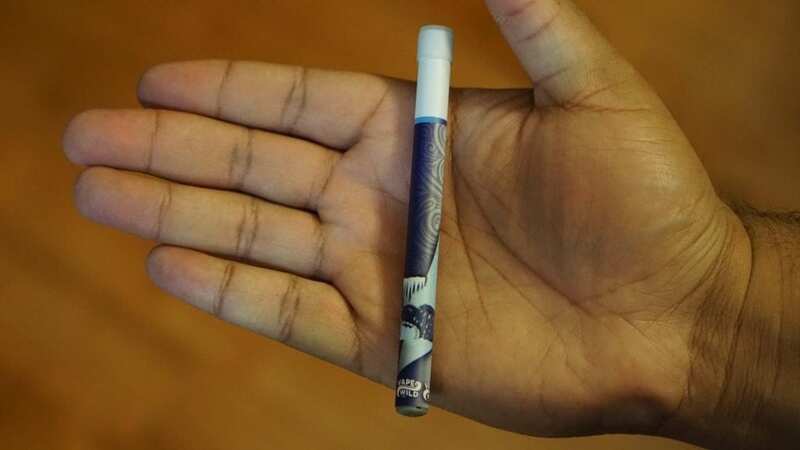 Also, since these are disposable, it does make sense that they went with this design rather than something else as many disposable e-cigs are designed in this fashion. In addition, with this type of design, it makes carrying the E1 easy! Each E1 looks different, and the aesthetics of each is based upon the actual flavor, which is once again a nice touch. The design you see on the packaging itself will resemble the look of the E1 inside. I definitely think this is a pro, as when you are looking for a specific flavor, you’ll know which is which by simply looking at it. All in all, my first impressions of the VapeWild E1 were all positive! The unique aesthetics for each flavor is a nice touch, and with its compact design, it makes it great for traveling with! Using the VapeWild E1 over a period of 2 weeks have been a pleasurable experience. Like mentioned previously, due to its compact design, it makes this device great for traveling! I can easily slip the E1 into my pocket with no issues, and for our female subscribers, you’ll have no issues carrying this device with you in your purse or even your pocket! Also, using the VapeWild E1 is incredibly easy, all you have to do is simply inhale and that’s it! There’s no on and off buttons, no batteries to charge, so you don’t have really worry about anything when using it. Once you put your mouth on the side where the mouthpiece was originally on, you can take a vape similarly to an analog, and exhale. 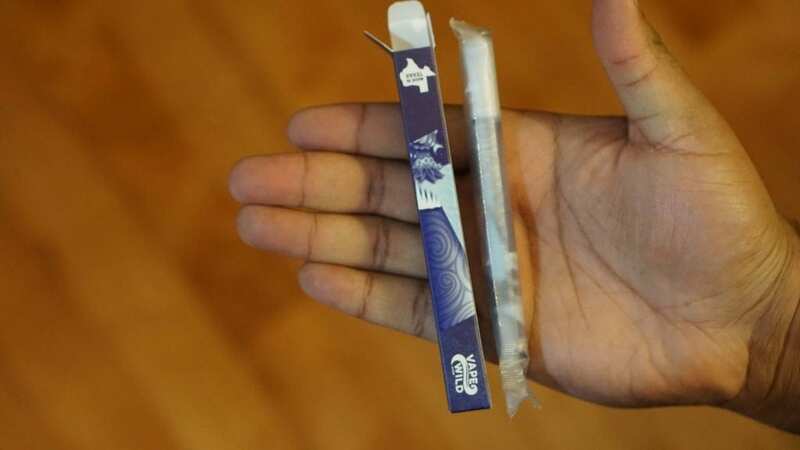 This is perfect for the beginner who either is just switching from smoking or wants something simple to use. There’s no learning curves when using this device, which is a pro in my book. VapeWild does claim that each E1 is able to provide you with about 500 puffs before it no longer works. I do find this quite accurate, as one of the E1’s would last me a solid week before needing to switch to a new one. Of course, this may vary with other vapers. Since this is 18mg, you probably wouldn’t be chain vaping, so I do see this lasting quite a bit of time before needing a new one. All in all, using the VapeWild E1 has been a great experience. It’s extremely easy to use, making it a great option for those smokers making the switch to vaping. Now the biggest question of this review is how does the VapeWild E1 perform? Well, I can surely say they have excellent performance! Now, I do want to mention that I typically do not vape 18mg nor mouth to lung. However, it was definitely a nice change of pace going back to a mouth to lung setup after vaping direct lung for a long time. The throat hit you get from 18mg is extremely satisfying, and I’m sure a smoker who picks one of these up will likely stay with vaping. As mentioned previously, the VapeWild E1 is available in 6 different flavors which are Wrangler, Strawberry Waterfelons, Morning Ritual, Grand Poobah, Cowbow Cooler and Apple of My Ice. Each provide you with a unique vape experience as they are fairly different from one another. My 3 favorites are Strawberry Waterfelons, Cowboy Cooler and Apple of My Ice. Strawberry Waterfelons literally taste like an strawberry watermelon bubblegum. Cowboy Cooler is a Berry Menthol and tastes exactly like its described. I personally prefer menthol vapes when I do vape mouth to lung, so this was definitely towards the top of the list in regards to my favorites. However, Apple of My Ice is definitely my favorite out of the bunch. This flavor is described as a Green Apple and Menthol, which is what it tastes like. At first I wasn’t sure what to expect, because I never tried a flavor as such, but I can certainly say it’s the best. The apple flavor really pops, and the added menthol gives it a satisfying exhale. 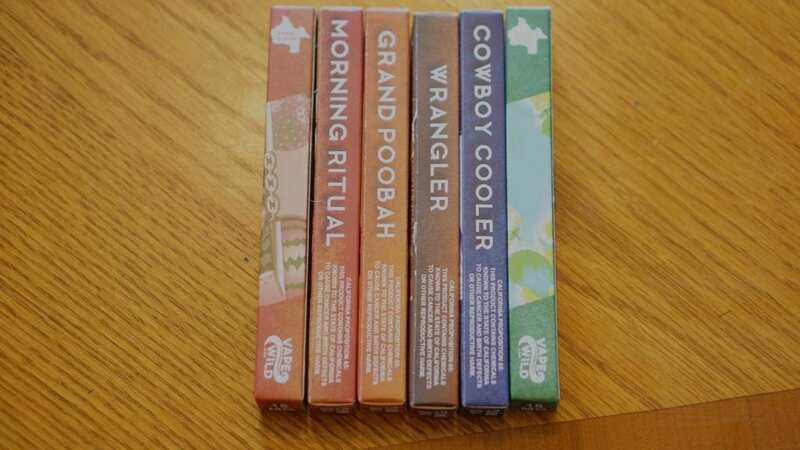 They do have 2 different Tobacco flavors which are Wrangler and Morning Ritual, which are also good, but the others are much better in my opinion. I do think new vapers will be attracted to these more so than the others since it’s a familiar flavor. All of the flavors they offer are tasty and straightforward which is definitely a good thing in my opinion as with this style of device, I think it’s the right approach. The vapor production of each flavor is also pretty good for what it is. However, don’t expect plumes of vapor with this style of device. One subjective con for the VapeWild E1 is that the only nicotine option currently available is 18mg. Personally, I would have liked a 12mg or even a 9mg option, as this would have suited me a bit better than 18mg. Regardless, the throat hit you get from 18mg is certainly satisfying, and the flavors are all tasty, so it’s not the biggest con. Also, another subjective con is that these are disposable; therefore you cannot refill it with your own e-liquid. This can be seen as a good or bad thing as some vapers prefer the simplicity and others prefer to use their own e-liquid. All in all, the performance of the E1 by VapeWild is fantastic! I’m sure vapers who love a great throat hit or wanting simplicity will absolutely enjoy the performance of the E1! In conclusion, the VapeWild E1 is an excellent device and is perfect for the beginner who is now switching from smoking to vaping or the vaper looking for an easy to use disposable vape pen. I do want to say that this device is certainly not for everyone, but is great for those looking for this type of device. The overall performance is excellent, and I never experienced any hiccups in regards to its performance. Like mentioned previously, I do wish that they had other nicotine strengths available, but I think for who its aimed towards, it’s probably the best nicotine strength to offer. Also, the fact that you cannot refill this device is subjective, and this is to be expected with this style of device. Other than that, I really couldn’t find any cons with it as this device simply works and does its job quite well. Priced at only $5.99 per device, I think it’s a great deal, especially since they are offering 12% off using the coupon code “CHEAPE1“! If you’re looking for an easy to use device that offers solid performance and you don’t want to worry about refilling, then the VapeWild E1 is something I highly recommend! I think the 18 mg is ideal and heavy smokers may actually prefer 24 mg . When switching anything less is very very UNLIKELY to satisfy the nicotine urge and that will always make a smoker go back to regular cigs . Make it 24 mg and i think VW has a real winner . Thanks for your comment! I did mention that offering more nicotine strengths would be a great addition. For the heavy smoker, 24mg would probably be ideal for sure. I do think 18mg is a good start though. It does make me wonder if these devices will be affected by the FDA Deeming Regulation and if these were introduced before the deadlines for new products ?